On the 16th February 1971 the purchase of the southern part of the Severn Valley Railway as far as Foley Park Halt was agreed with British Rail. 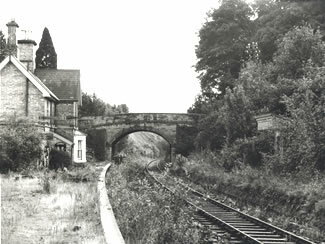 By 1972 the restoration of Arley Station had begun in earnest. The early part of the year saw a great deal of hard work clearing the down platform of ten years worth of trees and undergrowth. By the end of the year the down platform face and edging had been repaired, mains water and electricity had been installed at the station for the first time and five Great Western Railway gas lamps had been erected on the main platform. New running-in boards had been erected (showing the station’s name) and a summer camp school party had gathered up all the surfacing bricks on the down platform to facilitate its levelling and re-laying. The station had also been repainted in the early 1930’s GWR style. By spring 1973 the platform awning had been repaired, the brushwood on the down platform had been completely removed, the former weighbridge had been converted into “Sid’s Café” and (reported the Severn Valley News) the future visitors’ car park to the rear of the down platform had been levelled. 250 concrete sleepers had been delivered for the bay and passing loop (actually now the main running line) and the north and south loop points. Adderbury signal box had been obtained as a replacement for the one removed, and a large hole had been excavated in which to plant the up starting signal’s post. Sadly it was also reported that Daisy Jones had died on the 15th January 1973. Work to be completed by the 1974 season included the painting of the toilets and installation of new sinks, further restoration work in the gardens and the laying out of the sleepers through the main platform. Another event of note was the opening of the station shop. Work still outstanding was more tree and shrub clearance at the northern end of the station and fencing around the station house. In Spring 1974 it was stated that it was the intention to relay the “loop” and rebuild the signal box in time for the 1975 running season. The station was re-opened with due ceremony (including a brass band playing on the platform) on the 18th May 1974.